BoldrDash initiated the first leg of its new B-3 Trifecta format with its Winter Dash event at Canonicus Camp in Exeter, Rhode Island. For those of you unfamiliar with this Series, it is one of the longest operating North Eastern based OCR's currently running. It is also one of the “New England Spahtens” #racelocal 2018 events. There's a reason that the “Biggest Little Race in the Union” continues to operate where many others have failed. The following is a sample of this race experience. 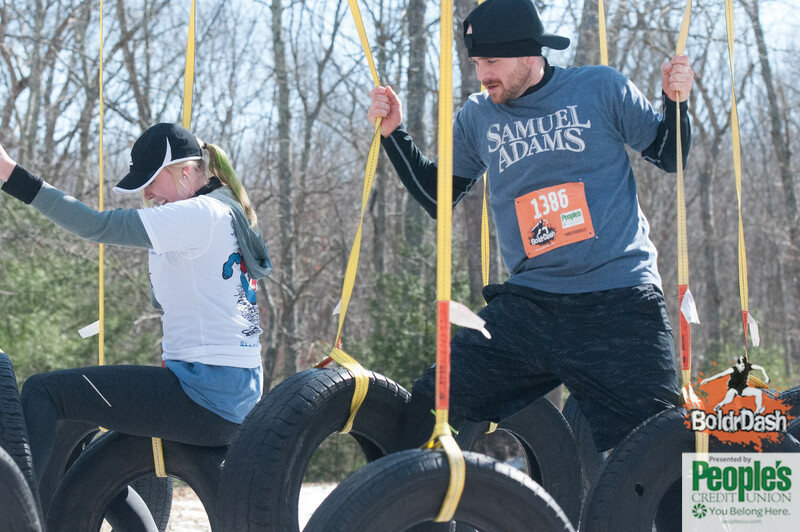 If you primarily run the larger Races like Spartan and Savage Race, you will begin to appreciate an event of this stature the minute you pull into their parking lots. There weren't any large lines or traffic backups when you arrive at the venue. Pay the fee to the volunteer, follow the arrows to the designated field and allow yourself to be guided into your final destination via 3 National Guard enlisted. Also, there was a 10 passenger shuttle to the site if needed but only a 3 minute walk if you opted not to indulge. It could not have been optimized any better. The registration table was indoors at the Camp’s conference center. The line for that was just as fast and efficient as the parking. Give the cheerful administrator your name and waiver, they hand you back your bib, t-shirt and start time… simple. The bag check was FREE as was water and coffee for racers and spectators alike. Also, there were ACTUAL bathrooms and not port-a-potties for your convenience. Being able to prepare indoors on the 20-degree day was a welcome surprise. 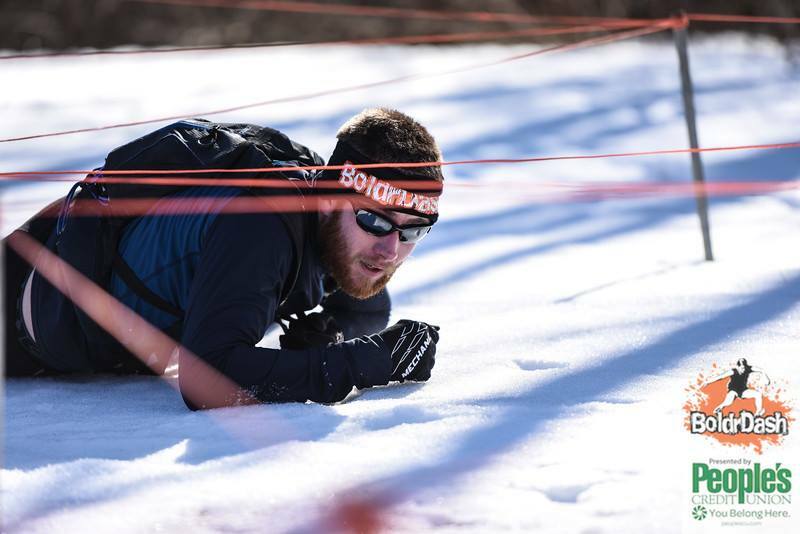 Retaining your body heat as you tighten your laces, affixed your bib and made last minute layer decisions was definitely appreciated. The starting line was just outside of the conference center. You couldn't miss it or the digital clock counting up towards your time to run. An enthusiastic M.C. dressed in St. Patrick's Day attire did a terrific job of making sure everyone knew what heat they were in and when to begin. He also led a fun warm-up session to music until your time was up and the race was on! 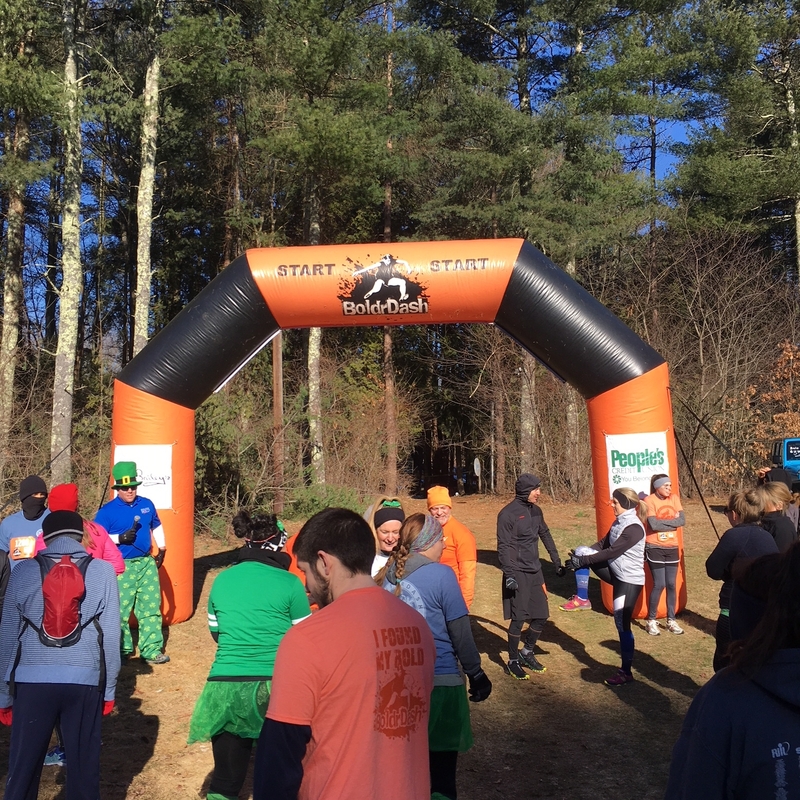 The course consisted of wooded trails with the occasional patches of snow and short stretches of rocks and boulders. Elevation changes were minor but there were plenty of rolling hills to get the heart rate up. Man-made bridges crossed several streams and places where the reservoir was swollen. At various locations, I felt the urge to slow down briefly and take in the scenery. I tried to imagine how it would look during the other seasons. The view was pretty engaging without any life or greenery to speak of. It was in these moments that I appreciated this not being a chip timed event. As much as I love to see how my performance compares to the other athletes, timed races don't afford you the luxury of stopping to “smell the roses”. I was told by a volunteer that this was a 5k distance, but my GPS measured it out to be exactly 4 miles. I must say, the degree of difficulty with some of the obstacles was unexpected. Both the “Tire Swing” and BoldrDash's take on the Rig were worthy adversaries. Also, I have climbed many cargo nets in my day but have seldom traversed them. This new take was a nice twist from the conventional. Many of the obstacles had multiple degrees of variation from novice to expert. One example of this was the traverse wall which was comprised of 3 separate walls each more difficult than the last. The first wall had larger hand and footholds. The next, smaller hand and angled foot pegs and the final wall had no foothold at all much like the popular American Ninja Warrior obstacle “Cliffhanger”. Worth mentioning are the 2 different tube crawls. The first was a standard flat crawl with the 3 tubes stacked like a pyramid. You could opt for one of the base tubes or the one stacked on top. I chose the top and regretted it at the end. Due to how narrow the tubes were, I could not get my legs out to brace my landing. Essentially I had to pull myself all the way through and the just clamber down to the dirt. The other tube crawl was called the “Shimmy and Slide”. It used the same diameter tubes as previously mentioned but on a teeter-totter. Inside you had to wriggle your way up the cylinder until you reached the pivot point and your weight brought you to slide down the remaining portion. 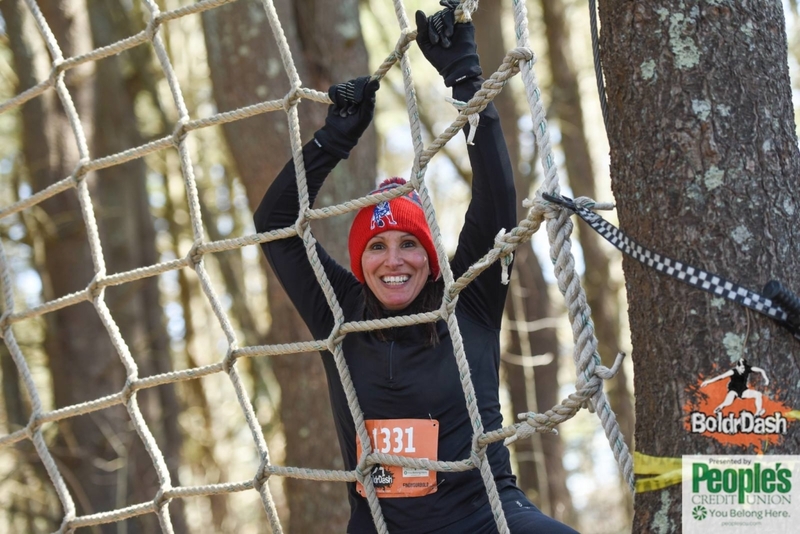 Other obstacles included a rope climb, several walls, and their signature “Boulder Run”. There was plenty of variety to test your strengths and weaknesses throughout the course. After you cross the finish line you are rewarded for your accomplishment with a medal. A handsome design that definitely won't get lost on your medal rack with its winter logo that captures the spirit of the event. I was told that the t-shirt given out at registration is one of a kind design to this particular event. I appreciated the slate blue color as it is unique to all of the gray and black finishers shirts that I have procured over the years. Back inside the conference center, there were raffles for different prizes with the proceeds going to the “Find Your Bold” non-profit charity. They also had a souvenir table for additional gear and sponsors education patrons about there various products. You could also sign up for the next leg of their B-3 Trifecta titled “Color Me Bold”. 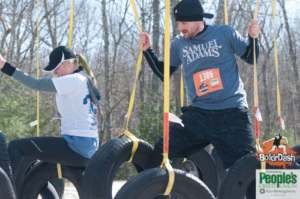 That race is Saturday, May 12th and you can register through Mud Run Guide. Be sure to check for a discount code! 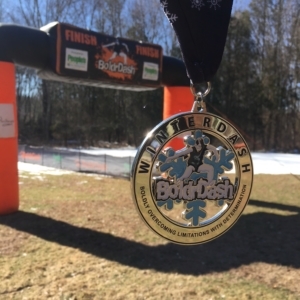 Overall I give the 2018 BoldrDash – Winter Dash 4 1/2 out of Five Stars. For the distance, and the stature this was really a well-run event in all aspects. I personally would like to see them introduce a competitive, timed heat. I feel if they do, it might potentially attract a much broader audience and also validate them in the OCR community. 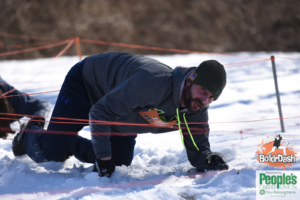 Even without it, I think this is still a great run that even elite obstacle course runners can enjoy and use as a tune-up or time trial for the long season ahead. Have you done an Bold r Dash?